Also serving communities of Bonners Ferry. To help you with your search, browse the 10 reviews below for assisted living facilities in Sandpoint. On average, consumers rate assisted living in Sandpoint 4.1 out of 5 stars. Better rated regions include Hayden with an average rating of 4.5 out of 5 stars. Caring.com has helped thousands of families find high-quality senior care. To speak with one of our Family Advisors about assisted living options and costs in Sandpoint, call (855) 863-8283. Sandpoint, Idaho has a senior population of almost 20 percent and is known for tourism and recreation, due to its close proximity to scenic Lake Pend Oreille and the Schweitzer Mountain Ski Resort. There are four assisted living facilities near Sandpoint and all are licensed and regulated by the Idaho Department of Health and Welfare. Assisted living facilities (ALFs) in Sandpoint are residences that have three or more adult residents who are not related to the operator and that provide necessary supervision and personal care assistance, along with meals and room and board. The cost of living in Sandpoint is 108.8, which is 8.8 points higher than the U.S. average, which could hurt seniors living on a budget. It is considerably higher than the Idaho average of 95.1. The sales tax rate in Sandpoint is 6.0 percent, the same as the national average. However, income tax in Sandpoint is 7.4 percent, 2.8 percent higher than the U.S. income tax rate average. Violent crime in Sandpoint is less than half the national average and few points below the state average, which may give seniors peace of mind. Property crime, however, is double the state average and a few points above the national. Seniors in Sandpoint may want to take extra precautions to secure their belongings when out in town. The climate in Sandpoint is wonderful for seniors who enjoy outdoor recreation. The city has about 175 sunny days each year and has a July high temperature of 81. In winter, Sandpoint gets 59 inches of snow per year and has a January low of 23. The Sandpoint area is home to world-class medical facilities, including Bonner General Health and Hospital, in the event of medical emergencies or illness. The Sandpoint Senior Center has provided a gathering place to enjoy food and fun for more than 40 years. It offers activities such as line-dancing, bingo and lunches. Seniors also enjoy day trips and opportunities to give back to the community. Assisted Living costs in Sandpoint start around $0 per month on average, while the nationwide average cost of assisted living is $4,000 per month, according to the latest figures from Genworth’s Cost of Care Survey. It’s important to note that assisted living rates in Sandpoint and the surrounding suburbs can vary widely based on factors such as location, the level of care needed, apartment size and the types of amenities offered at each community. 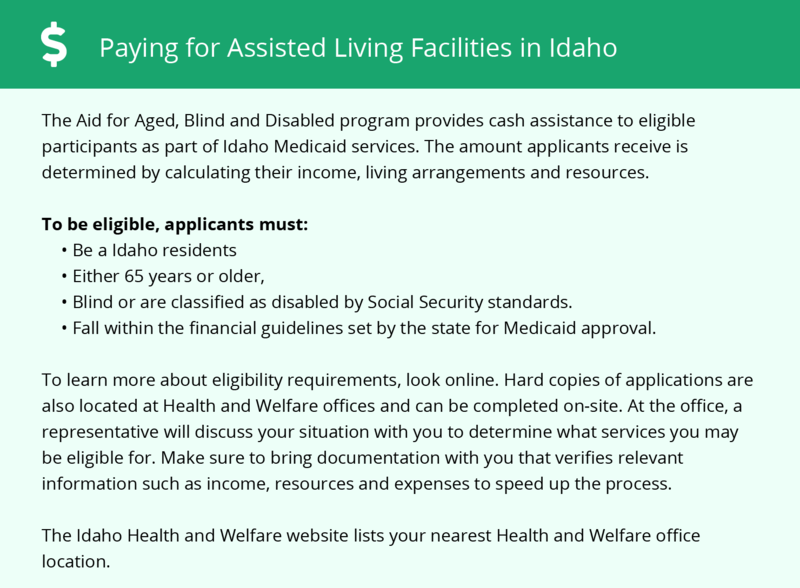 The Idaho Department of Health and Welfare offers two Medicaid-based programs to help with the cost of assisted living care. The Medicaid State Plan Personal Care option and the Medicaid Aged and Disabled 1915(c) Waiver Program are available for those who qualify. Sandpoint and the surrounding area are home to numerous government agencies and non-profit organizations offering help for seniors searching for or currently residing in an assisted living community. These organizations can also provide assistance in a number of other eldercare services such as geriatric care management, elder law advice, estate planning, finding home care and health and wellness programs. To see a list of free assisted living resources in Sandpoint, please visit our Assisted Living in Idaho page. Sandpoint-area assisted living communities must adhere to the comprehensive set of state laws and regulations that all assisted living communities in Idaho are required to follow. 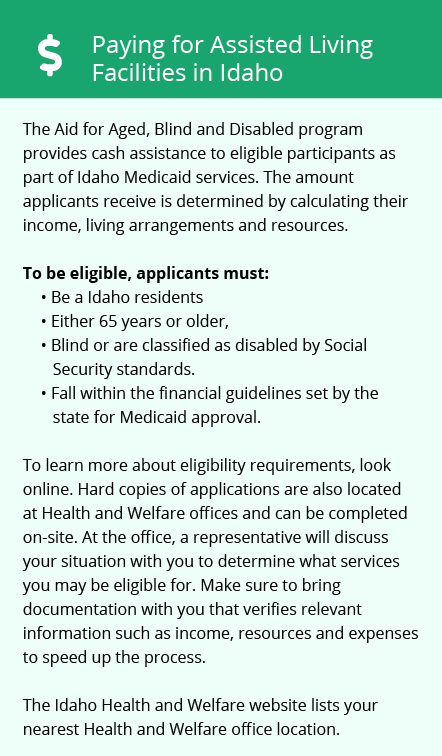 Visit our Assisted Living in Idaho page for more information about these laws.